eh? The iPhone 8 is $700. You've misunderstood. The $ price is not quoting the US price, it's quoting the EU price which is then translated into US based on exchange rates. I think you've misunderstood. How does $700 = $929? Also there was this comment from another site ( who also had the information first). "It’s not possible to directly convert currencies from the Euro prices, as they will include sales tax and Apple’s international pricing is never directly inline with US pricing either." Is this true? If so, needs to definitely be included in the article above. Looks like the Euro price includes VAT. Personally I think the Xs will be more like $849 since a $200 jump to the plus would be a bit much and out of line with previous releases. 6.1" replacing iPhone 8 with same 64GB storage for $700, iPhone XS $100 cheaper than current X for the same 64GB but starting at 256GB so $900 and current iphone X 64GB will drop to $800, iPhone XS Max under $1000 for 6GB but starts at 256GB so will be $1100-$1200. This time around Apple is trying to provide better tech but at slightly reduced price. So Apple is going to drop the price of the X by $100? When have they reduced the price of the newest iPhone before? I don’t think the 6 was cheaper than the 5s it replaced. You're comparing different sizes where costs clearly had to increase for their given level of quality. They have dropped device prices many times and I'd be willing to bet that Canukstorm is based that on Apple's history of dropping the price after expensive, new technologies have paid for themselves in terms of original R&D costs and a lowering of component costs. 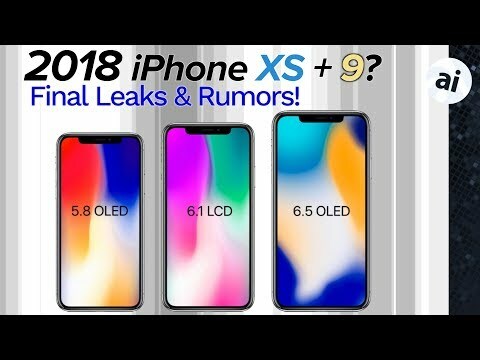 The word is that the 5.8" iPhone will still start at $999, but if they the OLED and True Depth components they're using have dropped and they know they can produce enough units to serve a certain expected increase with the influx of new customers for that lower price point they would alter the price if it earned them more earned income for the model. This Toyota official link( https://www.toyota.com/camry/ ) details 2019 Camry with CarPlay as standard feature. Detailed spec of all 2019 camry models listed. I was hoping that there would be a significant price drop, since the local price for the X starts around A$1300. I'd like to see that come down a bit, but with this rumour, and the fact that our government is playing the most expensive game of musical chairs, resulting in the lowest exchange rate in years, means it's probably going to cost substantially more here. I'm also keeping my fingers crossed for a price drop on the rumoured LCD model. You're comparing different sizes where costs clearly had to increase for their given level of quality. They have dropped iPhone prices many times and I'd be willing to bet that Canukstorm is based that on Apple's history of dropping the price after expensive, new technologies have paid for themselves in terms of original R&D costs and a lowering of component costs. The 6S wasn’t cheaper than the 6. The 7 wasn’t cheaper than the 6S. And I believe the 8 actually increased in price. I’m not aware of any example where the flagship iPhone got cheaper (other than more storage for the same price). ASPs are higher than ever. Why would those devices be cheaper? Why would the Xs be cheaper than the X? Again, just as we've seen with other price bumps and drops when expensive new tech is introduced it's not unreasonable to think that the 5.8" iPhone for a given year could come down in price. Do you remember how the move to both IPS and Retina displays in the MacBook Pro with a new milled chassis caused a hefty hump in price which eventually dropped? If costs come down and they can make enough devices they may be able to make more profit from the product line through additional unit sales by reducing the price because it opens it up a many more potential customers. What exactly is confusing about that? The real question is why you think prices are set in stone once raised and will never go down despite you knowing full well that they have? I'll probably end up with the 6.1 inch one unless one of the models has Pencil support. If one of them has that I'll buy it price be damned. (Though who knows how much I'd actually want to draw on my iPhone.) While I'd love the camera system that's in the X I simply don't need it, I almost never take pictures with my iPhone. If I was running social media for an organization it'd be great, but I don't think I'll need that over the next two years. And OLED verses LCD isn't something I care about. The major benefit tends to be, "Hey it can go brighter than it already can which is insane because it can be blindingly bright already!" I really don't need a screen that's marginally nicer than my new MacBook Pro or my iPad. So long as the screen is an upgrade from the SE, I'll be happy. I think this might be the most ho hum I've been for an iPhone update in years. Mostly because I would have gladly just kept my iPhone SE if the battery wasn't starting to drain weirdly fast. That $500 was with a two year contract, not $500 outright. That was ridiculously expensive for the time. Again, tell me when a new flagship iPhone launched at a cheaper price that it’s predecessor. The 6S wasn’t cheaper than the 6, the 7 wasn’t cheaper than the 6S and the 8 actually went up in price.